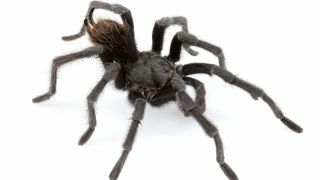 A new species of black tarantula discovered in Southern California has been named after the late Johnny Cash. Aphonopelma johnnycashi was discovered living in the wild near Folsom Prison, California – the jail which inspired a song by the iconic singer. Cash also performed a series of concerts for inmates there during the 1960s, even recording live album At Folsom Prison in the facility. The breed is one of 14 new types of tarantula discovered by biologists in the southern US. Dr Chris Hamilton tells the BBC: ”It’s found along the foothills of the western Sierra Nevada mountains, and one of the places that’s there is Folsom Prison. It’s a perfect name. It fits the spider – it’s found around Folsom and the males are predominantly all black, so it fits his image. Cash is not the first rock star to have an animal named in their honour. A ‘muscly’ fireworm fossil was named after former Black Flag frontman Henry Rollins at the end of last year. In 2014, Swedish palaeontologist Mats Eriksson named a half-metre worm in honour of King Diamond, while Ozzy Osbourne has an Amazonian frog named after him because of its unusual bat-like call.